Prototype: 4 different "pa" containers from Eras III and IV. 1 each "pa" type Dzkr double container for things such as cement. 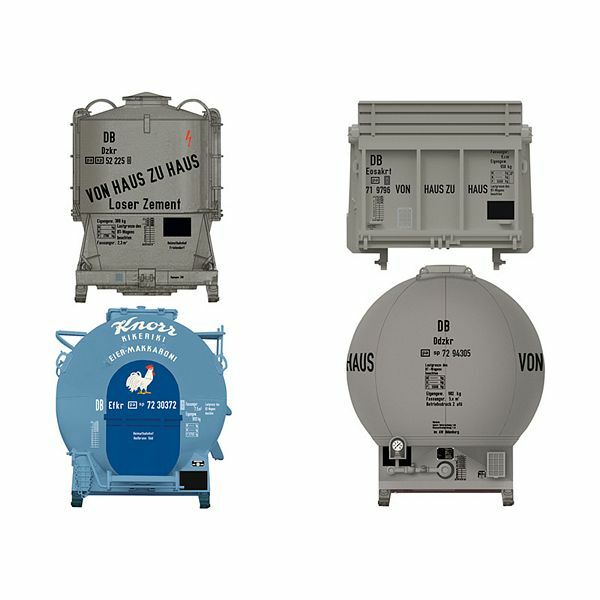 1 each "pa" type Ddzkr spherical container for powdered freight, 1 each "pa" type Eosakrt open container with steel set-up walls, 1 each "pa" type Efkr container for granular bulk freight. Model: This is four (4) different "pa" containers as an accessory set. The containers can be used as decoration on model railroad layouts as well as interchangeable containers for type Lbs, BTms, and BT container transport cars that have already been delivered previously. All of the containers are finely and prototypically imprinted. 4 interchangeable containers, can be used in Eras III and IV.